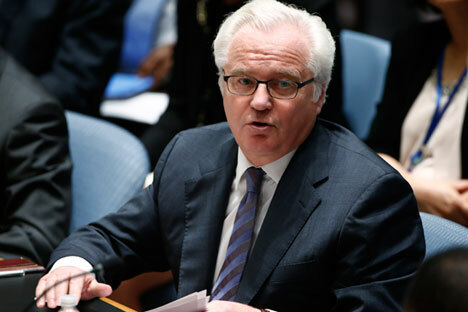 Russian Ambassador to the United Nations Vitaly Churkin. Vitaly Churkin, Russia’s Permanent Representative to the UN, said in an interview to business daily Kommersant that "too much importance" not be given to recent statements by Syrian President Bashar al-Assad about fighting on, despite international agreements to implement a ceasefire. We outline highlights of the Russian diplomat’s interview. Vitaly Churkin: We shouldn't assign too much importance to some of the statements, dramatize them… This is my personal point of view. I heard on TV President Assad's statement [about fighting until victory is obtained and the impossibility of observing a truce]… It obviously contradicts Russia's diplomatic efforts. There is the Vienna process, the latest agreements with the International Syria Support Group reached in Munich that include the ceasefire, the cessation of military activity in the foreseeable future. We are working on this now. But the Syrian president is acting according to a certain political framework. And here I think we should take into consideration not what he says, with all the respect to the statements of such a high-ranking individual, but what in the end he will do. If the Syrian government, despite its internal political disposition and the propagandistic line that it must conduct, follows Russia's leadership in regulating this crisis, then it will have the opportunity to exit the crisis with dignity. If, on the other hand, they stray from this path – and again this is my personal viewpoint – there will be a difficult situation, one that will also involve them. What is Russia trying to achieve in Syria? Secondly, [we believe that] this can ultimately lead to a political settlement. I think that if we hadn't entered Syria with our air force, the positive diplomatic steps we are witnessing now would not exist. The most intransigent oppositionists, who are supported by Turkey and Saudi Arabia, are still convinced that they can "break" Damascus. This was one of the reasons for continuing the conflict. Now, I hope, they and those who support them will understand that a political settlement is necessary. The Americans have already understood this. Why is there a demand for Assad's resignation? V.C. : This is the opposition's demand. And this [insisting that Assad step down] is of course one of the mistakes that our Western colleagues made when the Syrian crisis began. They were acting under the influence of the Arab Spring…. He [Assad] was perceived as the embodiment of an undemocratic regime that needed to be changed. Indeed there were uprisings in Syria. But Russian and foreign experts who really understand the issue said that such a calculation was too frivolous, that Syrian society's structure is such that there is no sense in demanding the president's resignation, that he is not the only reason. As a result, Bashar Assad and his entourage manifested a certain hardness, which had certain consequences. As if that wasn't enough, then the terrorists appeared. Now we are witnessing a noticeable change in tone. The radical oppositionists continue to say that the sooner Assad leaves the better. But the Americans have started formulating their position in another way recently. They say that Assad must leave, but make it clear that the issue should not be forced. But the documents (the International Syria Support Group and the UN Security Council Resolution) say that Syrians themselves must come to an agreement on this issue. We don't discuss this subject matter at all: it will be as the Syrians decide. V.C. : I hope that it won’t happen. I think things are not heading in the direction of a global conflict, a "World War Three" with the participation of Russia, the U.S, NATO and so on. The full interview was published in Russian in Kommersant.